Developing fracking technologies and extracting previously inaccessible hydrocarbon reserves is the absolutely opposite direction to where the world should move, environmental activist Rose Braz told RT. This path would simply cause damage to public health and contribute to catastrophic climate change in the long run, she argues. RT: Environmental risks of fracking aren’t unique to that method of extraction – why such an outcry when there are other methods of energy production that are just as harmful when it comes to fossil fuels? Rose Braz: There’s no doubt that oil and gas production in general is risky to human health and ecosystems and our future in terms of climate change. 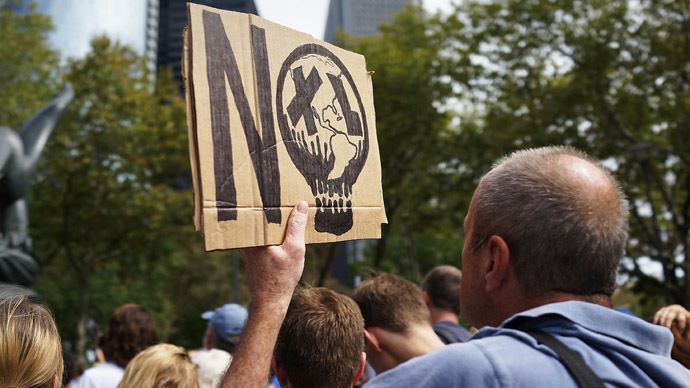 I think there are however some additional factors that are associated with fracking that make fracking a particularly risky form of energy development, which has led to these massive protests you’re seeing across the world. One, there are 632 different chemicals that we know are used in the fracking process. About 25 percent of them are known carcinogens. We have evidence of water contamination, from Dimock, PA to Pavillion, WY to Parker County, TX. These are associated with fracking. And the other thing that’s happened is that fracking has expanded oil and gas development into areas where it previously did not occur. A colleague of mine likes to call fracking ‘oil and gas development on steroids’. So many more communities are seeing fracking in their backyards and these risks are coming right to their next door. RT: Do you think you can balance that with the potential benefits? For better or worse, we are dependent on fossil fuels for our cars, for our petrochemical industry, for our plastics. The US has boosted its own economy because shale gas exploration in this way. Europe may follow suit. Do you think that’s worth the risk for things like energy independence? RB: The recent report by the Intergovernmental Panel on Climate Change came out just a couple of weeks ago and it reiterated what has been found before by the International Energy Agency. We need to keep about two-thirds of known fossil fuel reserves underground to stand even a chance of avoiding the worst impacts of climate change. So now is not the time to be delving into extremely risky new forms of fossil-fuel development like fracking and acidization – that are new forms using chemicals and millions of gallons of water – and exacerbating a climate crisis precisely at the time when we need to be moving towards truly green, clean, renewable energy. We need to start keeping fossil fuels in the ground right now. Eliminating these new extreme, unconventional forms of energy extraction like fracking is the way to go, not expanding them. I think communities around the world are recognizing this and that’s why you have a ban in France, just upheld by the Supreme Court in France. We have a moratorium in New York in this country. And we’re fighting to keep fracking out of California. RT: There are some studies that have found adverse effects in many areas. There are other studies showing there aren’t negative consequences in other geographic areas. Could the issue be more about individual safety measures at sites rather than the method itself? RB: There’s a long history of communities being impacted by fracking and oil and gas development, and families reaching confidential settlements with oil companies to receive compensation on the sort of damages they’ve suffered. There’s a long history of that happening here and the reality is that what we do know, despite the money and the confidential settlements, are places like Pavillion, WY where the EPA came in and initial findings were that fracking chemicals had made their way into water supplies there; Dimock, PA, where people have been forced to buy bottled water because they were unable to drink their water. Despite the best efforts of oil and gas companies to keep these damages under wraps, we’re seeing more and more evidence of fracking’s impacts. Even the best regulation can’t make these threats and risks go away, and particularly the risk to our climate. Here in California, we have 15 billion barrels of oil that they now believe are accessible through new fracking technologies, and really that is an amount of carbon dioxide, carbon pollution, that is on par with what the US emits in an entire year if we were to extract that and combust that. So we’re talking about adding tons of CO2 to our environment and our climate precisely at the moment when we need to be moving away. RT: California did pass an anti-fracking measure and there are others I understand that are following suit. Are laws like that the answer, in your opinion, to stopping the practice? RB: We believe the practice is simply too risky to our air, our water, our public health and our climate to continue. So what we are fighting for with communities all across this state and the country – and internationally, with these 200 actions taking place at the Global Frackdown – is for a ban on fracking.